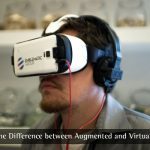 Virtual Reality vs Augmented Reality - Let's Dig Deeper! I love you Google! Wait, I mean, we love you Google, because, we use Google and Google products every single day — accept that! In fact, for an Internet user, no single day is without a few Google searches. It’s literally the tech giant and web assistant for our needs, you know. From searching something to finding the available flights from Delhi to Mumbai, Google search is there to help. As for Google products, Gmail and Maps have become some of the digital necessities. In this course of time, you would have said ‘I Love You Google’ at least once. As in my case, I do that often. There are times Google and Google products have become extremely helpful at times. Such as when I was stranded in a new city or when I needed to watch some cool tutorials. And, there are several reasons why I love Google so much. In this article, we will have a look on the things that I love about Google and its various products. I, personally, am a person who plans a lot. Suppose I’m going to someplace that I’m not familiar with. At those times, Maps have become quite beneficial for me. It takes me through the inside routes and teaches me how can I reach from a place to another. The best part now is that Google Maps is offering support for Flights, Local Transport and Cabs. What happens in most cases is that I can book an Uber, right from the Google Maps app in no time. I understand the issues of privacy and safety here, but we’re from the usability aspect. If you use Google searches often, you can understand how personalized the results are. We are not just talking about the web results, but also what happens in Google Now. By understanding what we are looking for, Google always gets me the best results from web. That’s the case regardless if I’m looking for some text content, video, images or something else. Personalization is something that I love and I love Google search for that awesome feature. Thanks to Artificial Intelligence and powerful algorithms, every single bit of information is tailored for our needs. And, we can access all of that, from different devices. This aspect is very useful when we need results as quickly as possible. If you are someone who cares for time and effort that you put into web, this is an excellent feature, we bet. When you are a professional who needs to handle a lot of emails, Gmail is a reason to say ‘I Love You Google’, not once but often. We have seen many email providers come and go, but Gmail has maintained its position for a long while. It has a lot of features to offer too. 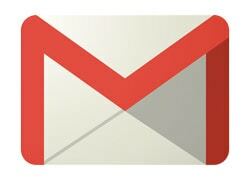 In a few of our previous posts, we had shared some Gmail Tricks and Tips. We had introduced a bunch of apps that can convert Gmail into a collaboration tool. In short, it’s packed with everything that we need. That is, ultra-fast email transmission, the tight integration with other Google services like contacts, Google Drive and all. So, this is something that I really love about Google Mail. I do understand the important alternatives like Outlook. But, Gmail always does the job clean and makes me love Google. I’m not just talking about the Google Drive storage space you get for free. Instead, it’s about the entire data that Google stores about us. As you know, if chosen, you can store all your important contacts, application details and preferences in a Google server, instead of local storage. This is a cool feature if you use an Android feature often. I have found this feature helpful in many situations. For instance, I had to change my phone a few times, but could not back up information to my system. In such cases, I had to seek the help of Google digital storage. As you know, by simply signing into the Google account, the entire contact list will be copied to the new device. This feature was not just time-saving but also required less effort. In this situation, I had to say ‘I Love You Google’. Not just once, but every single time I mess up with my devices. And, almost all data stored on Google servers are accessible from different devices — which is a bigger perk. There are a lot of tools that make me communicate well with others. Being a content writer, most of the Google solutions are helpful for me. First of all, we like to show an example named Google Dictionary. We had covered it in our collection of the best chrome extensions for productivity. It helps me learn new words by finding the meaning asap. 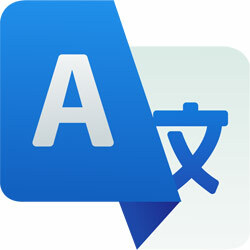 Similarly, there is the popular Google Transliterate, which is a big step towards bridging the gap between languages. More often than not, the Translations made from Google are accurate and contextual. So, when I find a French website for reference, I can simply translate it to read the content in English. As a web writer and blogger, these communication-oriented products of Google have certainly helped me. Needless to say, the Android apps for corresponding solutions are something of a blessing. For instance, isn’t great when you can read your favorite books on your smartphone? Not a single day passes for me without using an Android device. For one, I respect the work done by other developers and contributors. That having, the major reason why I love Google is Android Operating System. 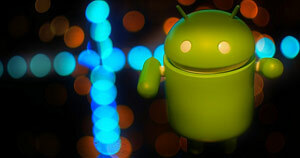 Without the involvement of Google, Android would not have become what it is today. Let that be Google Now integration, Gmail features or something else – everything has a Google touch that makes things clean and simple. Personally speaking, I’m a big fan of the Material Design and the stock Android releases. They come with subtle features. Our tastes apart, you have the freedom to choose custom ROMs as per your needs. Among the entire collection of web browsers, I have a special care for Google Chrome. It’s simple, minimalistic and has a bunch of cool features. And, the major feature is its easier compatibility with Google products, such as Gmail, Drive, Maps and whatnot. If not for the Google integration, I would not have used Chrome. But, now, every time I use Chrome, I have to say ‘I Love You Google.’ It’s a matter of fact that there are some serious privacy concerns behind the Google dominance and Chrome integrations. That having said, for those who don’t mind RAM eating, Google Chrome would be the optimal web browser. And, if you don’t love Google for that, what else do you love it for? So, these are the seven major reasons why I, personally, love Google so much. As you see, I haven’t mentioned many of individual products here. On the other hand, the focus is on the concepts and solutions. 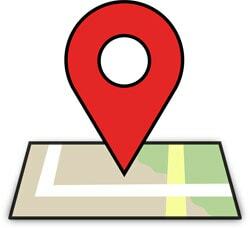 For instance, Google Maps is one thing that has revolutionized navigation and traveling. With thousands of people benefiting from it, it’s not about specific features anymore. Like these, there are many small features in every single concept of Google products. And, in one way or another, I love Google for those cunning developments. 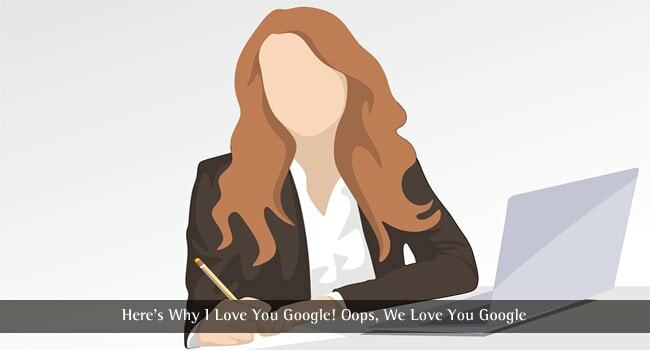 By the way, what do you say ‘I Love You Google’ for? Do let us know your preferences through comments. Indeed here you shared seven reason why we love google but there are many more reason why we love google because every day we used google products for example Gmail, for searching anything and more. So without google everything is less. Yes, I Love Google too. Fully agreed with all the reason. Nice to here about Google. Google has been always my favorite. But now, I am thankful for the information you share. I love Google Chrome and its translated services. Thanks for letting us know the other information too. I always love Google. 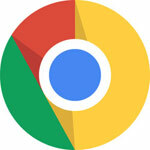 With Google bringing in updates frequently everything about the internet keeps improving. Thus helping individual find solutions to their problems both personal and business ones. All these Google products listed are just amazing. Google is worth the love.